Finally. Progress. It seems like it takes 10 times longer than I plan out to finish a freakin’ project around here….sheesh. 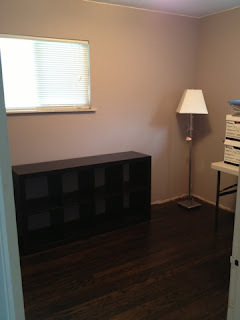 Tackled both the BF’s office (in blue) and my future craft room (in purple). Old wallpaper had to be removed (thanks sis! ), walls had to be washed (thanks me!) and paint had to be applied (thanks BF!). It was a long process and I considered cutting corners many times, but in the end, it was worth it. Here are some tips that I took away from this project. 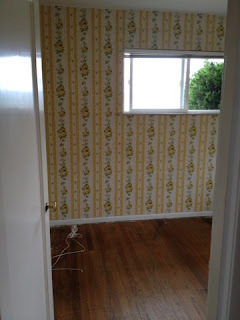 Wallpaper removal: I tried the steamer at first and it worked, but took WAY too long for each section and seemed to only take off the top layer. Perhaps using my clothes steamer wasn’t the best idea….bit the bullet and eventually bought the gel and the scoring tool. Wall prep: As annoying as washing is, it’s a must in my book. TSP is my go to (I know, I know…chemicals…ew.) but it does the J-O-B. These walls were funky and I knew that washing would be the only way to get that residual glue off. Buy the oversized sponge (and a back up!) near the rest of the wallpaper supplies at your local home improvement store and use a plastic scraper in the places where the glue is really caked on – it’ll save your shoulder from all of that scrubbing! 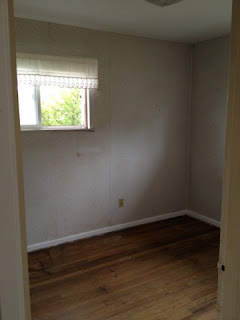 I also took the time to carefully spackle and sand, which I must admit, I really enjoy! I like the DAP Dry Spackle that looks like yummy pink frosting and dries white so you know when you can sand away. 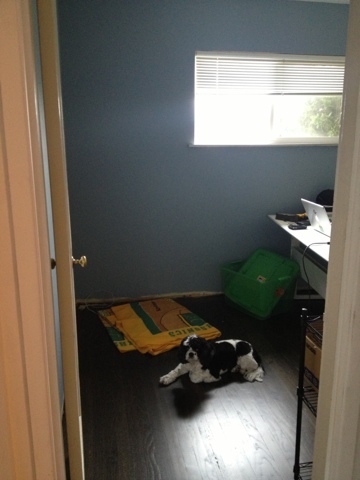 Painting: Both of these rooms are 8×10 feet so didn’t feel too bad splurging on some Ben Moore paint. One coat was ALMOST enough, but I had plenty leftover for touch ups. The colors really feel deep and vibrant and not washed out. I think I’m becoming a paint snob. 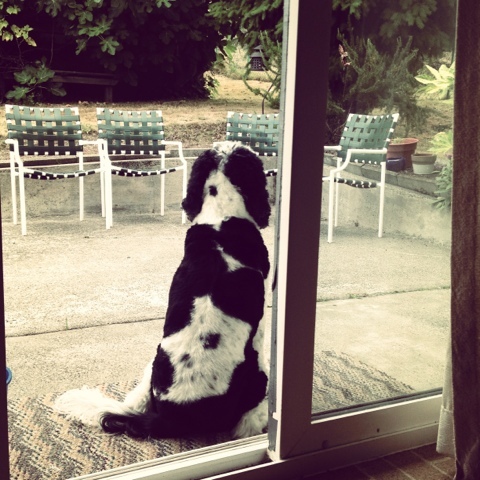 This is Stella’s new favorite spot in the house – squirrel patrolin’ in the backyard. We’ve had her here for about a week now and I think she’s finally starting to settle in. I was worried that she wasn’t going to adjust and get comfortable – we’ve been in boxes for the past month – in the condo one minute…at my mom’s the next….and now here. I could tell she was getting worried and nervous – she even stopped eating for a few days. I even started to wonder if she was going to get sick again. My plan for the next few weeks is to keep her at home (sorry Mom & Dad) so that she knows this is her forever home and that we aren’t leaving anytime soon. Lots of love and attention will be on the agenda along with plenty of walks! Man, it’s tough being her. So yeah. 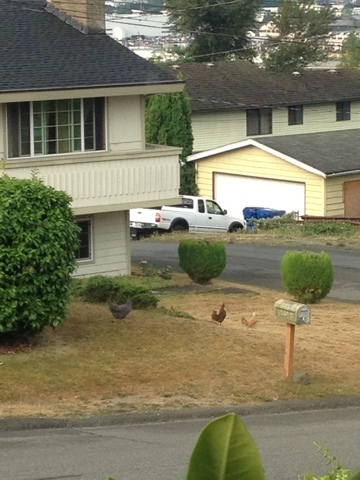 We’ve got some “free range” chickens in our neighborhood along with an illegal Seattle rooster. They were kinda charming when you could only faintly hear them, but now that they’ve escaped (? ), I’m not so sure……do I become the mean neighbor just weeks into moving in and call Seattle Animal Control or just let ’em roam wild? A dozen fresh eggs per week would keep me silent – just sayin’…. To add onto my new love of Feng Shui….. The number 3 sounds similar to the character for “birth” and is considered a lucky number. The number 3 is significant since there are three important stages in a person’s life (birth, marriage and death). The number 0 means All or NOTHING as it is an absolute number. Not sure if this is a good thing or not….I’m thinking not? The word for 8 sounds similar to the word which means “prosper” or “wealth.” The number 8 is viewed as such an auspicious number that even being assigned a number with several eights is considered very lucky. Since 8 pretty much the best number, I’m gonna say that it cancels out the two 0’s, which leaves us with 3, which is also a bangin’ number 🙂 OK, so maybe my logic is way off here – sorry Chinese numerology! And according to Feng Shui, our house energy number is 2. To get this number, you add up your house numbers until you get to a single number (3+8=11, 1+1=2) The number 2 represents balance, choice and cooperation. Hopefully, our move to the city will help us get back to a more balanced life full of cooperation and choices! OK guys, I’m about to get a little hippy/new world on your arse……we’ve had such bad luck and energy around our condo that I’m hoping to turn things around a bit with some help from some ancient cultural ‘ish. Although I’ve never been a very religious/spiritual person, I do believe that this new start is just what we need and anything I can do to appease the gods/energies/deities/spirits/higher ups/etc. should be done. Maybe I’m just hanging on by a thread here, but it’s worth a shot, right? 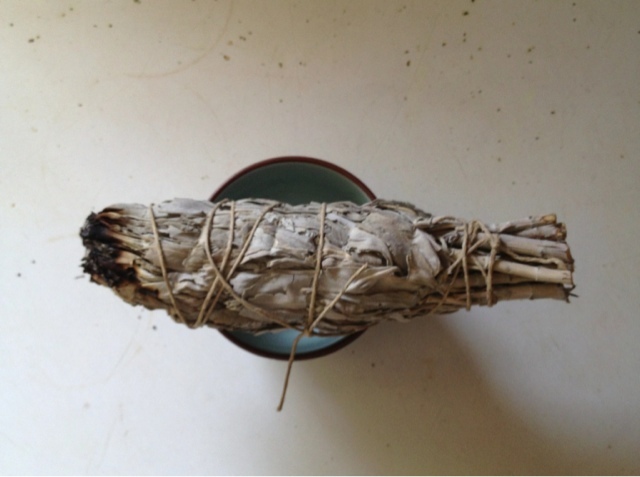 The smudging ceremony is a Native American tradition that cleanses bad feelings and negative energies from houses. It is done by burning specific dried herbs and letting the smoke float around the house. The idea is to work clockwise through your home, making sure to hit every nook and cranny with that smoke. 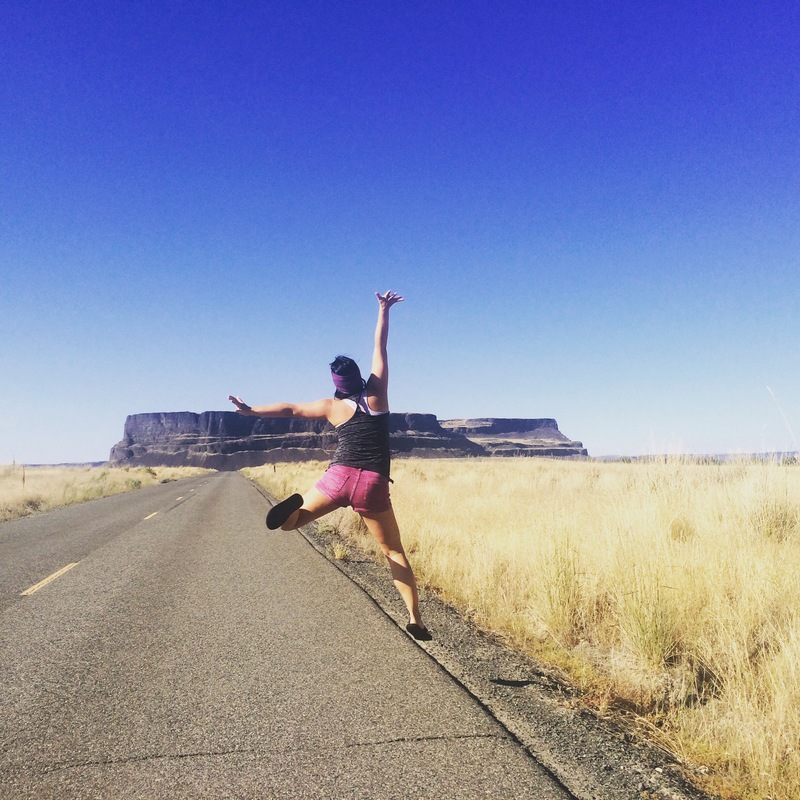 While doing this, I also set our intention in this new home (I know, I know….this was the part I always disliked the most when attending yoga). I don’t know the story of the previous owners, but I’ve found a few hints around the house. Although I suspect this was a happy home, I don’t think it’s a bad idea to re-set the energy of our new place. With so much bad energy and stress over actually getting it, I wanted to be sure we leave that ‘ish at the front door. Speaking of the front door, our new house is south-facing and gets full sun. OMG, I’m so excited about this! My acupuncturist diagnosed me as “damp” this past winter so being in our fully shaded condo wasn’t exactly the best place for me. I suspect we’ll be nice and toasty in the summer months in our new digs, but having access to full, glorious sun is going to be ah-mazing. OK, back to Feng Shui……south facing makes our front door a FIRE element and the Bagua energy of fame and reputation. Front doors are extremely important, since that is where all of the energy enters your home. At first, I wanted to paint the door black (purely for ascetic reasons) but after some research, I think I’m going to go with a vibrant yellow or red in order to appease the Feng Shui energies. I’m also going to accent the door with other FIRE colors including purples, deep oranges and pinks. I think a few bright planters just might do! In many cultures, this hand pattern represents a protection against the evil eye (a malignant spiritual influence caused by the jealousy of others), and the evil eye has historically been a popular superstition among my BFs people. Gotta represent! Not to be left out of the fun, is my side of the clan. I can’t seem to find much about special things to do around the house to help with energies and such, but I did find a lot of symbols that I’m going to incorporate into the decor. Cherry Blossoms: Cherry blossoms have been revered by Japanese since like foreve. The flower’s brief blooming time and the fragility of its blossoms, has led to an association with the transience of life. I already own a series of photographs with Japanese cherry blossoms, so I’ll be sure to hang these up! Cranes: Cranes in Japan generally represent longevity and good fortune. I’m now on the hunt for a large, white ceramic crane to add to our living room decor. Come on West Elm – why you holding out on me?? Frogs: Twenty-seven species of frog are found in Japan. Due to an agricultural economy based on the flooded rice paddy, the presence of frogs is considered to bring good fortune. Ceramic frogs are often sold at shrines as the Japanese word for ‘frog’ is the same as ‘to return’. I think one of these will be living in our garden shortly. Wisteria: Flowering in early summer, purple wisteria flowers have been depicted in Japanese kimono for many hundreds of years. Wisteria is also used in many Japanese family crests. I envision building a nice little arbor over our back patio with plenty of fluffy, purple wisteria hanging down.